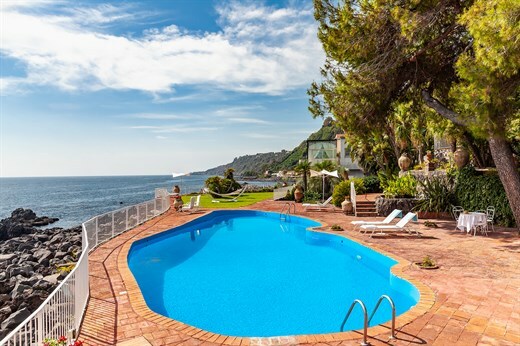 Elegance, style, daily service and a stunning seafront position... a truly top range villa. Crossing Together (Crossing the Rock and Casa alla Scala taken together) is a rare find indeed: top quality accommodation with plenty of space for large groups of friends or family, sensational views, extensive panoramic grounds and terraces and a large pool: all at the heart of Santa Maria La Scala, one of eastern Sicily's most authentic and picturesque little fishing villages, with a range of seafood restaurants and a rocky-pebble beach. ⁵ guests staying at Crossing Together have privileged, reduced-rate access to Belmond Villa Sant'Andrea's exclusive lido on the beach at Mazzarò. Crossing Together is formed by two large independent apartments in a late 19th century palazzo overlooking the sea. Inside: Crossing the Rock occupies the second (top) floor of a sea-front villa and is accessed either via an internal staircase or a private lift. The apartment is organised in a U shape, at the centre of which is a large, fully-furnished terrace looking out to sea. The entrance hall, at the bottom right of the U leads on the right to two large, interconnecting, high-ceilinged drawing rooms, both comfortably furnished with elegant sofas. The first has views onto the harbour, while the second has both sea and harbour views and access to the central terrace. Behind the smaller of the two drawing rooms is the dining room which has its own terrace looking over the harbour and access, via a corridor, to the wonderful kitchen where the cook will prepare your meals. A corridor at the base of the U is home to a double bedroom and two double-twins, each with large French windows onto the central sea-view terrace. Opposite them are two beautifully fitted shower rooms. At the end of the corridor is the kitchen and snug room with large flat-screen TV and access to a series of terraces, the gardens and the pool. A corridor leads up the left-hand side of the U, where there is a children’s bedroom with twin beds, a small study with laptop and printer, two more lovely bathrooms (one with shower and one with tub) and, at the end, the large, stunningly designed master suite, with access to the central terrace and a private sitting area with treadmill looking out to sea. Furnishings and fittings throughout are of the highest quality. Inside: Casa alla Scala is on the first floor of a handsome sea-front house. Stairs lead to the main entrance which opens into the comfortably furnished living area offering views of the harbour. A central partition wall divides the living area from the luminous sea-view dining area, which itself accesses a wonderfully panoramic covered sea-front terrace. A small corridor leads from the living room to the well-equipped kitchen, perfectly placed for keeping an eye on the fishing boats arriving back in port! Next to the kitchen is a double bedroom with en-suite bathroom with tub and shower. Heading back to the living room one accesses the main sleeping area, composed of a master double with en-suite shower room and a double-twin with a shower room across the corridor. Both these two bedrooms have sea views and access to the balconies and terraces that run along in front of the apartment. The master bedroom may also host a single children's bed on request, bringing the total capacity up to seven. Once again, fittings and furnishing throughout are of the very highest quality. Outside: Crossing the Rock offers no end of outside space. The central sea-view terrace is perfect for dining, lounging, aperitifs or just gazing out to sea, the dining room terrace is a great spot for al fresco meals, while the series of terraces, walkways and gardens to the left of the U are home to the large pool and a canopied sea-view pergola, all ideal for soaking up the sun, relaxing or indulging in fun and games! A sea gate leads from these terraces down to the large lava stone rocks and the limpid sea beyond. Casa alla Scala boasts three fabulous outside areas, all sea-facing and all interconnected via a walkway and accessible from Crossing the Rock via a series of gates and steps. The first terrace is accessed directly from the indoor dining room and offers the perfect shady spot for breakfast or an evening aperitif. Its views of the harbour and the sea are spell-binding. Following along a path one arrives at the solarium, a lawned terrace with sun-loungers with yet more divine sea views. The two front bedrooms both have direct access to this area. Continuing along the path one comes to what will probably become most guests' favourite spot, a large fully-furnished covered terrace with cushion-strewn lounge furniture, dining table and a fabulous outdoor kitchen including sink, dishwasher, hobs and a barbecue. The icing on the cake is that the fishing village of Santa Maria La Scala (on the doorstep of your own private oasis) offers a series of excellent seafront fish restaurants, bars and lidos with bathing platforms. Service: Crossing Together offers an impeccable level of service, including a member of staff who will prepare breakfast, and a maid who will carry out daily cleaning. A cook is available on request. The pool is natural and free of chemicals of any kind. It is filled with either sea water or with fresh water (depending on the season) which is completely changed every 3 to 4 days. Please note that there is no real shallow end in Crossing Together's pool, whose minimum depth is 1.3m. Guests staying at Crossing Together have privileged, reduced-rate access to Belmond Villa Sant'Andrea's exclusive lido on the beach at Mazzarò. Crossing Together costs slightly more than the sum of the individual prices of Crossing the Rock and Casa alla Scala because the daily maid service at the former is extended to Casa alla Scala (where it is not usually included) when both properties are taken as Crossing Together. Santa Maria La Scala, on the sea below Acireale, is a characterful working fishing village, still relatively untouched by tourism except during August and summer weekends when it attracts locals from Catania in search of the sea. Its harbour (where you can hire a boat), sea-front fish restaurants, bar and bathing platforms are on Crossing Together's doorstep. Other lovely fishing villages, such as Aci Castello and Acitrezza, dot the coastline, while nearby Acireale is great for food shopping. Taormina is just a short drive up the coast, fascinating Mount Etna awaits exploration behind you and Catania is just a short drive down the coast. Further afield, Siracusa is about an hour's drive away, but also suitable for day trips are the UNESCO World Heritage towns of Noto, Ragusa, Modica and Scicli. There's even a golf course within striking distance if you fancy a round! "There are no adequate superlatives to praise the villa and its staff. They were both simply amazing. Our holiday was outstanding." The setting of Crossing Together is sensational. The staff were brilliant. I can honestly say that the experience exceeded our high expectations and was exemplary. Fantastic. Crossing Together was such a special and relaxing place. The staff were wonderful. Our holiday at Crossing Together was memorable! The entire experience was extraordinary. The house and grounds were magnificent, and the chefs wonderful, both every day for breakfast and the two night a chef came in. The dinners were memorable and exceeded every expectation in a country celebrated for its food. Would highly recommend use of the cook. She was amazing. Large choice of menus, excellent quality, great value for money, and no washing up! Crossing Together far exceeded expectations; the setting was authentic; very little English was spoken by the restaurants which actually made it more fun; the whistles of the produce sellers each morning; the colourfulness of the people living and working all around us was a joy. We enjoyed everything. There are no adequate superlatives to praise the villa and its staff. They were both simply amazing. Our holiday was outstanding. We'll recommend you unconditionally and look forward to booking our next trip through you. Thank YOU! I am not being lazy by giving you 5s for everything. The villa, the staff, the experience - everything was fantastic. I loved every minute. You exceeded my expectations on every level. It was one of the best holidays I have ever had and I have had some spectacular ones. This is a magnificent property. I am already recommending it to others. I loved cooking at the villa. The outdoor kitchens were wonderful. Amazing villa, amazing location and fantastic staff. Couldn't do enough to make our stay such a pleasure. We used the cook and we would highly recommend her food. We enjoyed spending time in the beautiful villa with amazing views over the sea. There was 14 of us aged from 6 months to 80 years and the villa suited all our needs. No part of the holiday we didn't enjoy. Crossing Together provided the perfect setting and amenities for our family of 12 (7 adults and 5 children). The villa is well appointed and the grounds are beautiful. All of the bedrooms and baths were comfortable and nicely furnished. The owners have attended to every detail. It is difficult to imagine a finer villa in all of Sicily. The staff adds an element of luxury and convenience. We used the cook for all 7 evening meals and this was a true Sicilian dining experience with a master chef whose charm and gracious manner made every evening an experience. The daily service was an added bonus and made stay delightful. The caretakers were charming, friendly, and caring. The town was delightful and the villa position presented a setting for beautiful evening gatherings. In my opinion, the reviews which I had read understated the beauty and charm of this villa. It was extraordinary. Adults and children enjoyed the entire experience. The staff was just excellent. The views of the town and sea are just spectacular. The house and staff were terrific. Quite a fabulous property. We had both my son and daughter's families with us and the space for everyone to be together or private made the stay a success. Hi Rosanna & all the team at Think Sicily, I just wanted to let you know we had a fabulous week at Crossing the Rock. Sometimes you see a place to stay and it has a few disappointments when you arrive, but Crossing Together met all our expectations and more. The staff at the villa were delightful and accommodating. I would certainly be happy to refer Think Sicily to friends in the future. The 13 members of our family had a wonderful time... The space inside and out was far more than expected... Our cook, Rosa Maria, was outstanding. She was flexible and a master cook. We found all the staff exceptionally friendly and helpful...it was a fantastic holiday and villa... a stunning place where we had a fantastic week. The whole family had a great holiday together. The villa was fantastic and the staff worked really hard to deliver great service. It was wonderful having someone to do the shopping, cooking and cleaning up - all we had to to do was relax and enjoy ourselves. Santa Maria La Scala was a beautiful unspoilt village. Excellent! What we enjoyed most about our holiday? The house!... The owner, was the perfect host. He bought supplies for us (for no charge), and came to check that everything was ok. The villa is more like a palace and the views are unbeatable... Although on the pricey side it's well worth the money - we were treated like royalty. Our concierge, Francesco, was fantastic. Nothing was too much trouble.